Joseph receives the plates from Moroni. Relief on the west side of the monument atop the Palmyra hill. W. Aston photography. Image 2. A general view, facing south, of the west side of the Palmyra hill, near the summit. This is the general area where Moroni buried the plates. Large flat-faced rocks, like those shown in the foreground, are common on the hill. W. Aston photography. The final, decisive battle bringing about the end of Nephite society took place about ad 385 (recounted in Mormon 6:1–15) around the Hill Cumorah, the same location formerly known as the Hill Ramah, where the Jaredite nation had earlier ended in battle (Ether 15:11). As the leader of his people, Mormon had buried the collected records of his people in the Hill Cumorah, entrusting his abridgement of them to his son Moroni (Mormon 6:6). Mormon died in the ultimate battle, leaving Moroni to protect and even add to the Nephite record while still avoiding the victorious Lamanites as he wandered. Three and a half decades later (about ad 421; see Moroni 10:1), Moroni ends his writing and prepares to bury the sacred items in a hill. The years of travel had brought him northward to the Palmyra area of upstate New York, [Page 236]where the cooler climate would aid in the preservation of buried materials and where they would be accessible when required in the Restoration. Realistically, for the three decades of wandering that brought him to the Palmyra area, Moroni could not have carried heavy items such as sizeable rocks in addition to the metal plates, breastplate, sword of Laban, Liahona, and the Urim and Thummim, as listed in the 1829 revelation to the Three Witnesses (Doctrine and Covenants 17:1). By his own account completely alone (Mormon 8:3, 5), we feel safe in concluding that when the time arrived to bury the plates, Moroni was restricted to local materials on hand in the Palmyra area. The Palmyra hill is a large glacial drumlin, formed during the last ice age. It belongs to a large region of drumlins that lie between Lake Ontario on the north and New York’s Finger Lakes to the south.3 Understanding how the drumlins formed is important to understanding the findings that follow; it also offers insights into why this particular location would become the place for Moroni to secure his precious record. These materials were deposited as hills elongated in the general direction of the glacier’s flow, with the highest point of the hill being “uphill” of the glacier’s flow direction and tapering down in the glacier’s [Page 238]flow direction.5 The highest point of the Palmyra hill lies, therefore, at its north end, with the long slope of the hill tapering away to the south. Image 4. The drumlin field in the area. Graphic courtesy B. Jordan. In the Palmyra area, most of the drumlins consist of a mix of stratified or layered gravels and sands. However, near the Palmyra hill is one today named Miners Hill, which is an exception: it is predominately formed of clay — something that might well have played an important role in the making of Moroni’s stone box. This hill will be discussed shortly. Also of possible relevance is the fact that the sides of drumlin hills tend to be steeply sloped compared with other sedimentary hills; this is very evident at the Palmyra hill. The high angle of the slope would place the box above the local water table by ensuring more efficient water [Page 239]runoff and preventing the accumulation of water around the box. This may be why Moroni chose to place the box near the top of the hill. On the other hand, faster water flow would likely have led to more rapid erosion in addition to the natural creep of soil downhill over time. Thus it is possible, if not likely, that the stone box was buried deep enough by Moroni to be completely covered by soil until erosion exposed its upper surface by Joseph’s time. Image 5. Panoramic photograph showing the profile of the Palmyra hill, facing east. Oliver goes on to describe the relative dimensions of the box, including the fact that it “was sufficiently large to admit a breast-plate, such as was used by the ancients to defend the chest, etc. from the arrows and weapons of their enemy. From the bottom of the box, or from the breast-plate, arose three small pillars composed of the same description of cement used on the edges; and upon these three pillars was placed the record of the children of Joseph.”9 For the purposes of this study, however, our focus will remain on the nature of the construction materials: stones and cement. With these descriptions in mind, a comprehensive survey of the ground on all sides of the Palmyra hill and its surroundings was conducted by the authors, taking particular note of the description that the rocks that made up the box were smooth on at least one of their sides. The survey examined rocks in all possible settings, in situ on the hill slopes, walls of rocks cleared from fields, and rocks incorporated into landscape features and buildings. Given the drumlin nature of the hill, the material of the hill consists of a wide variety of sedimentary material, large and small. Large cobbles (naturally rounded rocks up to about 25 cm/10 inches across) and larger boulders of the size necessary to form the box remain widely distributed across the surface of the hill and throughout the surrounding landscape. In particular, cobble to boulder-size rocks of laminated sandstone and rounded granite and gneiss are fairly common (see image 7A). One question that arises is what Oliver meant by his use of the word “smooth” in order to determine which rock type is likely to have been used in the creation of the box. The sandstone cobbles consist of a fine grained, slightly-reddish tan color, quartz-rich sandstone with a rounded outer surface. They easily split along lamination surfaces to form fairly smooth, flat surfaces that could fit Oliver’s description of the box (see image 7B). Another common rock found was eroded or rounded pieces of light gray-pink colored granite and gneiss, many of which had at least one side that was flat and smooth. Although their surfaces are not as flat, they are smoother than the sandstone (see images 7C and 7D). into landscaping, and rocks incorporated into buildings. W. Aston photography. [Page 241]It is worth noting, though, that as Oliver said the cement was prepared and placed in such a way that the rocks were “cemented so firmly that the moisture from without was prevented from entering,” the type of rock was likely important for another reason. One advantage in using granite over sandstone is that granite is generally much less porous than sandstone, thus sealing out moisture more effectively. This, coupled with the porous nature of the unconsolidated sediments that form the hill, would have allowed efficient water drainage from around the stone box. Any moisture that did not drain away would be kept from the box interior by the fine cement and the stone sides shaped, most likely, of granite. Image 7. Rocks found in the vicinity of the Palmyra hill fitting the description of those used to make Moroni’s stone box. Images A and B consist of rounded, but delaminated, sandstone. C and D are rounded cobbles of granite. B. Jordan photography. [Page 242]Our investigation to determine if rocks, as described by eye-witnesses, were available in or near the place of burial to form the box demonstrates clearly that they were and, indeed, still are. What Might Moroni Have Already Known about Cement? A reasonable question at this point is: could Moroni have known how to make the cement that was vital to construction of the box? Or would he have required assistance, either divine instructions or a helper? Moroni thus grew up within a culture in which making cement using the abundant limestone of the region was already a common skill or technology. So it is entirely possible, even likely, that he learned the skill himself, needing no assistance when in Palmyra. We conclude that it is most unlikely, therefore, that Moroni would have needed recourse to either divine or human help in the matter. An examination of what is now known of the cement skills available in Moroni’s day now sheds considerable further light on what he did while at Palmyra. The reference just cited in the Book of Helaman to houses and even cities built of wood and “cement” was universally derided in Joseph Smith’s day; even well into the twentieth century awareness of the nature of structures in Mexico and Mesoamerican remained obscure among scholars and the public alike. While the use of cement in the Book of Mormon period remains unknown in South America and in modern USA and Canada,10 today we know of hundreds of sites across Central America dating to that age — temples, pyramids, courtyards, palaces up to five stories high and other large buildings — constructed with, and sometimes largely composed of, high-quality concrete. These structures range up to 72 meters (236 feet) tall and can cover large areas. They have endured a humid climate, earthquakes, and hurricanes for up to three millennia and, despite the encroachment of jungle vines and roots since their abandonment around 1000 ad, have remained largely intact. Archaeology has further established that while precursors appear among the Maya as early as the ninth century bc, cement and concrete skills first appear as a fully-developed technology in Mesoamerica [Page 244]around the very period described in Helaman, the first century bc,11 a most significant correlation with the Nephite text. Ancient Maya cement, therefore, is essentially the same as modern Portland cement (the modern standard) and produces a strong matrix of concrete, comparable in every way to what is used in construction today. Perhaps a greater challenge to Moroni than locating suitable rocks would have been finding materials suitable for producing high quality, hard wearing cement in a large enough quantity to hold the stones together. While we do not know the exact nature and type of “cement” that was made by him, the materials in the immediate environment offer strong clues. As the box had to protect its contents for some 1400 years, something we can be certain of is that Moroni’s cement must have been of an enduring type, most likely similar to modern cements. The essential chemical ingredient of cement is calcium (Ca), produced from what is commonly known as quicklime, burnt lime, or simply lime (Calcium oxide, CaO) from either limestone or dolostone. Limestone is the easier of the two to process and thus the most preferable rock type; as already noted, limestone would have been familiar to Moroni from his own Nephite culture. Image 8. A large cobble of Limestone with the interior exposed. W. Aston photography. [Page 245]Producing lime in the pre-industrial period was a process that involved cooking pieces of limestone on a wood fire. Once the wood burnt down to charcoal, temperatures of up to around 1,600° C (~2,900° F) were reached.13 This resulted in a chemical reaction producing globules (“clinkers”) of calcium silicate (Ca2SiO4); after cooling, water added to the material made it expand to a powder of around 5 or 6 times the volume of the limestone. This was the cement which, added to an aggregate and water, formed concrete. [Page 246]Within the local drumlin, gravels and the limestone cobbles mentioned earlier and pictured above are found; they are of an excellent quality for producing lime. Post fieldwork analysis established that these limestone rocks are high in the critical compound of Calcium Oxide, CaO. Image 9. Limestone analysis results. Courtesy of B. Jordan. Of course, Moroni needed to burn wood to reduce the limestone to powder. Where this was done remains unclear, but the geography of the Palmyra hill may provide a clue. At the hill’s southwestern end is a small valley, or vale, situated between the hill and a low rise on the west that prevents anyone passing along the western side of the hill from seeing into the vale. Such a place could have provided him with the seclusion necessary to assemble the stone box and manufacture the cement while remaining undetected. With decades of experience avoiding detection in his long travels, probably making regular fires for cooking, we believe Moroni would have utilized such natural features as he worked to not draw attention to the actual burial location itself. Modern cements primarily consist of a mixture of lime, sand, and clay. Our investigation found that all three of these materials exist in close proximity to the Palmyra hill, and in sufficient quantities to make the cement necessary to form a stone box of the size described by Joseph and Oliver. Image 10. The drumlin geology of the Palmyra area is revealed in the layers of sand, gravel, and limestone inclusions at this quarry just southwest of the hill. Within the gravel was limestone of a grade sufficient to produce lime. B. Jordan photography. As clay is almost unknown in the Palmyra area, the clay that Moroni needed was the most challenging ingredient for us to locate.16 As noted earlier, however, some 3 km (~2 miles) due north of the Palmyra hill is a smaller drumlin called Miner’s Hill. Perhaps uniquely in the area, this hill consists almost entirely of fine clay. According to the current land [Page 248]owner, who allowed the New York Highway Department to mine it, it is the only location in the area that serves as a source of clay. Image 11. Testing limestone with diluted hydrochloric acid. W. Aston photography. Understandably, in Joseph Smith’s day it was the contents of the box — the plates — that held the greatest interest to believers and unbelievers alike. Still, there were those in both camps who also sought to see the stone box on the hill for themselves. There are no reliable first-hand accounts of what happened to the stone box. However, the most credible reports agree that the stone box, its capstone having been opened several times by Joseph Smith in his meetings with the resurrected Moroni over the years, and seemingly left open after he removed its contents, was now exposed to the elements and eventually washed in pieces down the hill. Image 12. Miner’s Hill in Palmyra is a rare drumlin consisting of fine clay. W. Aston photography. What seems certain, at least, is that Moroni’s stone box is no longer in its original position on the hill nor, despite some claims to the contrary, does any indication of the hole remain where it was once buried. The glacial processes of the Palmyra region brought together all the necessary materials to form the stone box, to manufacture the cement holding the stone components together, and fashion the three small cement pillars inside it. Moroni would have been able to access the rocks and sediments necessary without extensive travel or effort. Considered individually, sandstone, granite, and limestone are all, of course, very common rocks on the surface of the Earth, as are sediments such as clays and sand. This is also true of the formation of flat-sided sandstones and granite as they weather. However, finding all these rocks and sediments together in close proximity is more unusual. While such a grouping may not be accurately described as rare on Earth, given the needs of Moroni it was highly advantageous to his purposes to have all these occur in the vicinity of the hill in which he buried the plates. Joseph Smith noted in his History that the hill where he obtained the plates was a prominent landmark20 in an area where the terrain is quite flat and most hills appear nearly identical. This uniformity of size is common in drumlin fields and would have been especially true in Joseph Smith’s time, as much of the area had been deforested by settlers to make farmland. This prominence, coupled with the fact that the stone materials and all the cement ingredients are readily available in the vicinity, made the Palmyra hill uniquely situated for the purposes of Moroni. Image 13. The view facing west from the north end of the Palmyra hill. W. Aston photography. [Page 251]Were the geological materials necessary to make a stone box, consisting of sizable stones and the ingredients for cement, present in close enough proximity to the Palmyra hill to have been available for Moroni to build such a box? Are there rocks or stones locally available that match the description given by eyewitnesses or near-secondary sources? The answer to both questions is clearly a firm yes. While this information does not really say anything about the claim that the Book of Mormon itself is an authentic ancient record, from a geological perspective it firmly supports the idea that all the materials necessary to build the stone box that contained the plates, as described by witnesses, can indeed be found in the local area. 1. The hill under discussion is in Ontario County, rather than in Wayne County where the town of Palmyra lies. However, its proximity to the other locations where the Restoration began, such as the Sacred Grove and the Smith family home, means that the name “Palmyra” is much better known and is used to identify the hill here. 2. There is a huge range of literature of greatly varying usefulness dealing with the subject of the New World setting of the Book of Mormon. A good overview that also suggests three scholarly sources for those wishing more detail is “Where Did the Book of Mormon Happen?” Book of Mormon Central, May 8, 2018, https://knowhy.bookofmormoncentral.org/content/where-did-the-book-of-mormon-happen. 3. A good general introduction is Michael J. Dorais,”The Geologic History of Hill Cumorah,” Journal of Book of Mormon Studies 13, no. 1–2 (2004): 136–4 3, https://publications.mi.byu.edu/publications/jbms/13/1/S00014–50be6b50136ef13Dorais.pdf. A fuller treatment of drumlin formation is D. P. Hess et al, “Geospatial analysis of controls on subglacial bedform morphometry in the New York Drumlin Field — implications for Laurentide Ice Sheet dynamics,” Earth Surface Processes and Landforms 34 (2009): 1126–3 5, DOI: 10.1002/esp.1803. 4. See J. Menzies, “A review of the literature on the formation and location of drumlins,” in Earth-Science Reviews 14, no. 4 (April 1979): 315–5 9, https://doi.org/10.1016/0012-8252(79)90093-X. 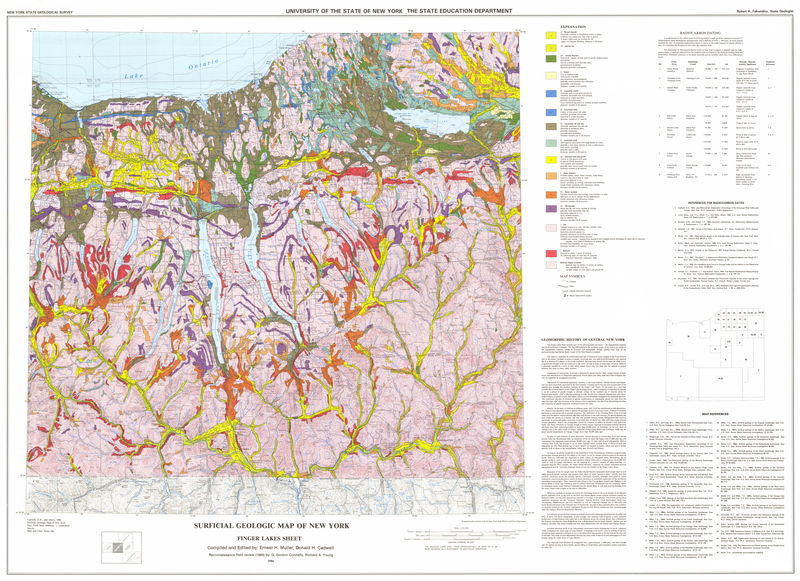 A large-scale map showing the formation of drumlins and lakes can be viewed at Surficial Geologic Map of New York: Finger Lakes Sheet, 1986, New York State Geological Survey, http://www.nysm.nysed.gov/common/nysm/files/surf_fingerlakes.jpg. 5. Although not all drumlins are formed of sedimentary deposits, the vast majority are (Menzies, Earth-Science Reviews, 14:319). The actual composition and structure of drumlins as well as their processes of formation is complex and still little understood. This paper makes no attempt to deal with those concepts. For in-depth discussion of the issues, also see C. R. Stokes et al., “The composition and internal structure of drumlins: Complexity, commonality, and implications for a unifying theory of their formation,” Earth-Science Reviews 107 (2011): 398–4 22, DOI:10.1016/j.earscirev.2011.05.001. 6. The possible reasons for burying the plates on the west side of the hill is the subject of a forthcoming paper by Warren Aston. 7. Joseph Smith — History 1:51–5 2 (emphasis added). 8. Oliver Cowdery, “Letter VIII,” LDS Messenger and Advocate (Kirtland, OH), Oct. 1835, 2:196, https://www.josephsmithpapers.org/paper-summary/history-1834-1836/95, (emphasis added). 10. This fact, of course, is of crucial significance in determining where in the Americas the New World account of the Book of Mormon played out. 11. See the summary provided in “When Did Cement Become Common in Ancient America?” Book of Mormon Central, August 26, 2016, https://knowhy.bookofmormoncentral.org/content/when-did-cement-become-common-in-ancient-america. 12. David S. Hyman, “Cements at Teotihuacan: A Criticism of Margain’s Appraisal,” American Anthropologist 75, no. 1 (February 1973): 314. https://anthrosource.onlinelibrary.wiley.com/doi/epdf/10.1525/aa.1973.75.1.02a00290, emphasis added. 13. The heat values of various woods when burned can be found at “Combustion of Wood — Heat Values,” The Engineering Toolbox (web site), accessed December 1, 2017, https://www.engineeringtoolbox.com/wood-combustion-heat-d_372.html. Charcoal can be produced at lower temperatures; see, for example, http://www.fao.org/docrep/X5328E/x5328e05.htm. Lime can also be produced without producing charcoal, but using just wood. The temperatures needed to produce lime in earlier times are discussed at https://www.sciencelearn.org.nz/resources/474-lime-a-time-tested-chemical. Regardless of whether charcoal or wood was used, Moroni could have easily produced lime from the limestone found near Palmyra and Manchester. 15. See New York State Department of Environmental Conservation, 2015 Fact Sheets Products of New York State Mines, https://www.dec.ny.gov/docs/materials_minerals_pdf/minfactsht.pdf. 16. Ibid. Clay is not mentioned in the report for the entire state. 17. A fascinating effort is underway to establish the nature of the “cave” or tunnel inside Miner’s Hill, see KC Kern, “Discovering Joseph Smith’s Cave in Miner’s Hill, Manchester, New York,” Archival.link (website), September 22, 2015, http://archival.link/mormoncave/story. 18. Edward Stevenson, Reminiscences of Joseph the Prophet, And the Coming Forth of the Book of Mormon (Salt Lake City, 1893), 13, https://www.gutenberg.org/files/54337/54337-h/54337-h.htm. 19. David Whitmer, interview with Chicago Times (August 1875), quoted in Ebbie L. V. Richardson, “David Whitmer: A Witness to the Divine Authenticity of the Book of Mormon,” (master’s thesis, Brigham Young University, 1952), 158, https://scholarsarchive.byu.edu/etd/5072/. As reported in the same paper (p. 166), David Whitmer also alluded to seeing the stone box himself in another interview. 20. Joseph Smith — History 1:51. Posted in Article and tagged Book of Mormon, geological features, gold plates, Moroni, Palmyra hill on November 23, 2018 . Bookmark the permalink. Benjamin Jordan received his PhD in geological oceanography from the University of Rhode Island’s Graduate School of Oceanography after earning his BS in geology, with honors, at Brigham Young University. His graduate work focused on the correlation and geochemical evolution of volcanic deposits in Central America. He is first or contributing author of three books and more than a dozen peer-reviewed articles. He has also served as a reviewer for multiple academic journals. His favorite work experiences have been co-leading fieldtrips in Oman and Hawaii and participating in research excursions in sixteen countries, including in the South Pacific and seventeen states, mapping and sampling underwater volcanoes. Currently Ben is an associate professor at Brigham Young University-Hawaii and an active member of the American Geophysical Union, the Geological Society of America, the Tsunami Society and the International Association of Volcanology and Chemistry of the Earth’s Interior. Warren Aston is an independent researcher based in Brisbane, Australia. Since 1984 his exploratory efforts throughout the Near East and Mesoamerica have identified the candidates for “Nahom” and the Old World “Bountiful” now accepted by most LDS scholars. In 2013 he co-founded the Khor Kharfot Foundation, leading several international teams undertaking fieldwork at the site. He is the author of In the Footsteps of Lehi (1994); Lehi and Sariah in Arabia: The Old World Setting of the Book of Mormon (2015) and numerous papers and articles. Warren’s findings have been reported in Church Education System manuals, BYU Studies Quarterly, Encyclopedia of Mormonism and the Journal of Book of Mormon Studies. They have also been presented at non-LDS forums such as the annual Seminar for Arabian Studies in the UK and in publications such as the Journal of Arabian Studies. His work continues in both Arabia and Mesoamerica, including a major Book of Mormon Central exploratory project focused on the hill Ramah-Cumorah. Is it only a common supposition that the plates were buried by Moroni shortly before his death and that the plates and artifacts remained untouched for some 1400 years until Joseph was allowed to see, then remove, the plates from the Palmyra hill? The plates might have been somewhere else entirely and subsequently placed in the Palmyra hill maybe even a few years before the 1820’s. I wish this article didn’t begin with the assumption that the box containing the plates was constructed by Moroni circa 421 AD. We have no evidence from the Book of Mormon, or any other source, that that is the case. While alive, Moroni never said he had traveled a great distance from the Mesoamerican Hill Cumorah before burying the plates. He never even mentioned burying the plates, stating only that he was about to “seal up” the records. And he mentioned no stone box, of course. Nor did the being who appeared to Joseph Smith to tell him about the plates say that he himself had constructed the box, or that he had placed the plates inside it. I think the most probable explanation for the plates’ presence in the stone-and-cement box is that the box was built, and the sacred relics were placed within it, very shortly before Joseph Smith was directed to them, thus making the box newly constructed at that time. And, as an aside, because of textual clues in the Book of Mormon, I think the plates were likely transported to their location in upstate New York by the three Nephite disciples. Two ceremonial statues in stone boxes were found at the archaeological excavations at the Etowah Mounds in the State of Georgia. The sides of these boxes were 29.5 x 19.5 inches. (Exploration of the Etowah Site in Georgia: the Etowah Papers, Morehead, The University Press of Florida, 2000 Edition page 106) Stone burial boxes were common in the Ancient American Midwest and Southeast. Those early Saints who believed the hill in Palmyra to be the Cumorah of the Book of Mormon included Joseph Smith (“Glad tidings from Cumorah”- D&C 128:20) , Oliver Cowdery & David Whitmer (Two of the Three Witnesses the Lord chose to witness for the Book of Mormon) the prophet’s mother and several others close to the prophet. In fact, there are at least seven documentary sources that confirm that it was Moroni who told Joseph Smith that the hill in Palmyra was known as Cumorah by the ancients. It is evident to this careful reader of the Book of Mormon that the hill in Palmyra is the Cumorah of the Book of Mormon. This is an assumption not warranted by the text. It was at the beginning of Moroni’s book when he stated that “I wander whithersoever I can for the safety of mine own life.” (Moroni 1:3) He then went on to quote extensively from the epistles of his father. It is highly unlikely that he carried the epistles of his father, along with the gold plates and the Liahona, while he was wandering and hiding from the Lamanites. The risk of losing them and of them burdening his wanderings and hiding would have been too great. It is more likely that Moroni was wandering in search of food for survival and returning to his base in Cumorah. There is nothing in the text of the Book of Mormon or the history of the Church to conclude that Moroni buried the gold plates anywhere other than the Hill Cumorah where the other records were stored. We have the personal accounts of several different men (Alvar Nuñez Cabeza de Vaca, and David Ingram) who were shipwrecked in the vicinity of the Gulf of Mexico and walked north up the Mississippi Valley unmolested by local tribes en route. In fact, most paleoindian tribes were friendly and hospitable to travelers, and Moroni would not at all have had to hide from anyone. There was no reason for Moroni to remain in the vicinity of hostile Lamanites. Indeed, he may have been led by the Spirit to travel to the location best suited to burial and future recovery by Joseph Smith of the Book of Mormon Plates. Moroni would most likely have followed the well-known Hopewell trade route as described in the Handbook of North American Indians (15:44-49). Indeed, it seems likely to non-Mormon scholar Richard Forbis “that small parties of Mesoamerican wanderers or traders circulated among the basically Archaic population” (Forbis in S. Gorenstein, ed., North America [St Martin’s Press, 1975], 85; Map 3.2). Robert, these accounts you mention only support the assumptions you are making – all possible, yet there is no certainty. I think Theodore Brandley is challenging the language that the location of the Hill Cumorah has been conclusively shown to not be the ‘Palmyra Hill’ and that this is now the agreed view. There are at least seven documentary sources that confirm it was Moroni who told Joseph Smith, prior to the translation of the Gold Plates, that the hill in Palmyra was anciently known as Cumorah. 1. The only first-person source comes from the epistle that Joseph Smith dictated on September 6, 1842, which was later canonized in the Doctrine and Covenants, Section 128. The inference is that Joseph knew the name “Cumorah” before the book was revealed. That knowledge could only have come from Moroni. This is substantiated in the subsequent documents. 2. An early documentary source confirming the above are the lines from a sacred hymn, written by W.W. Phelps. William Phelps lived with the Prophet in Kirtland and was in essence his executive secretary during the Nauvoo period. This hymn was also included in the 1841 edition as hymn #262. In both of these quotes from the Prophet’s mother she demonstrates that in her mind Joseph and Lucy both knew that the hill in Palmyra was named Cumorah, prior to the translation of the plates. All of the documentary evidence is consistent that it was Moroni who told Joseph Smith, prior to the translation of the Gold Plates, that the ancient name of the hill in Palmyra was “Cumorah.” There is no documentary evidence to the contrary. There is, of course, no archeological evidence to suggest that the Manchester hill is to be identified as the ancient Hill Cumorah, and Moroni never referred to it as such. I will provide more if you wish. There is no evidence that the Manchester hill was not the Hill Cumorah of the Book of Mormon. If it was so easy for Moroni to travel up the Mississippi River to what is now New York, why would the Nephites not have migrated there over their thousand year history? The problem with your argument, as I see it, is that neither Joseph Smith, Oliver Cowdery or David Whitmer knew anything about Book of Mormon geography, much less Book of Mormon archaeology. To quote hearsay accounts by someone quoting one of these three men, even if they’re quoting each other, is problematic in and of itself, since none of those statements on Book of Mormon geography can be found in those mens’ own writings. But to assume that they were expert on subjects they never studied at all and which aren’t covered within the Book of Mormon text or any other canonical source, is to draw unwarranted conclusions. Careful readers of the Book of Mormon should immediately see that the little drumlin in upstate NY could not be the Hill Cumorah of the BoM–it’s not a landmark distinguishable from any of the other many drumlins in that area, and certainly not one that everyone would know about from hundreds of miles away. Nor is it even one tenth as large as it would have to be to be the site of a battle where 220,000 Nephite soldiers would die, not counting their women and children and all the Lamanite casualties. It simply doesn’t fit the description. Moreover, archaeological evidence does exist that New York is not the place of the Book of Mormon hill Cumorah. John E. Clark, a Mormon archaeologist, described this evidence in an article which you can read on the bookofmormoncentral.org website. His article was originally published in Journal of Book of Mormon Studies 13/1-2 (2004), pp144-51, with footnotes on p. 174. What they knew or didn’t know about Book of Mormon geography and archaeology is irrelevant. They were simply quoting Moroni, who knew it all, and they were taking him at his word. The only way to get around the evidence that it was Moroni who told Joseph Smith, prior to the translation, that the hill in New York was anciently called Cumorah is to insist that it had to be in Joseph’s own handwriting. But to raise the bar for acceptable evidence that high we would also have to discard the entire Book of Mormon and most of the Doctrine and Covenants. The evidence we have would be considered a slam dunk on anything other than the location of Cumorah, because it is the Achilles heel of the Limited Mesoamerica/Two Cumorah theory. Theodore, I’m a little surprised that you continue to rely heavily on the wording of D&C 128. First of all, that section doesn’t purport to be a revelation from God. It’s a letter written by Joseph Smith, who knew nothing of Book of Mormon geography, and who, in writing his own official version of LDS Church history, published in 1842 never said a word about the messenger declaring the nondescript hill nearby to be the Hill Cumorah. And even if that were otherwise, D&C 128 in no way purports to contain any geographical assertions equating the New York drumlin with the Book of Mormon’s Cumorah. The statement constitutes poetic, geography-neutral language, alluding only to a place where the plates had once been buried. Even if it were intended as a geography lesson and Joseph thought the little bump on the landscape near his home was the Hill Cumorah, he was wrong. And the same is true with Parley P. Pratt, whose assumptions were all derivatives of what other people assumed. To prefer Oliver Cowdery’s hearsay account of what Moroni said (if indeed the messenger was Moroni and not Nephi–Joseph’s earliest version naming the messenger reported it was Nephi) over Joseph’s own account of what the angel said is problematic for another reason as well. We should all acknowledge that Oliver Cowdery had an exaggerated, grandiose and extravagant writing style. This fact is covered in KnoWhy 453 on the bookofmormoncentral.org website, where caution is urged in considering Oliver’s historical claims as always reliable in every respect, particularly on the the subject of Cumorah’s location. As the KnoWhy also points out, Oliver has one quote from Moroni which contains 1073 words. Are we supposed to assume such a quote, which Oliver wasn’t present to hear, is verbatim, or has Oliver taken some artistic license? I wonder if the most fundamental disagreement between us is actually rooted in our respective views of Joseph Smith and men like Cowdery and Whitmer. Though I accept them as great and vitally important men in the process of bringing us the Book of Mormon, it is not the least bit difficult for me to conclude that none of those three men knew as much about the text of the Book of Mormon, or the geographical setting suggested by said text, as the average careful reader of the book knows today. Perhaps such an assertion is, for you, a significantly more difficult pill to swallow. But the fact is that today, we study the BoM more carefully, and more often, than they did in the 1800s. And we have scientific research that aids our understanding, which didn’t exist in those early days. Just as we know more than Joseph and Oliver about chiasmus, Early Modern English, archaeological sites in Yemen and Oman, Semitic and Egyptian in the Uto-Aztecan family of languages, and cement and written languages in Mesoamerica, we’ve also studied BoM geography with greater care. It shouldn’t be heretical to say so. I suppose that the Nephites could in theory have migrated up the Mississippi Valley. The problem is that archeological evidence shows no such migration ever occurred. As to the incorrect notions that the Hill Cumorah was located in Ontario County, New York, archeologist John E. Clark evaluated that popular suggestion and found no justification for it in his article “Archaeology and Cumorah Questions,” Journal of Book of Mormon Studies, 13:1-2 (2004), online at https://publications.mi.byu.edu/fullscreen/?pub=1412&index=15 . Although the hill Cumorah in New York provides defensible high ground for a military command post, which has a commanding view of the battlefield plains around it, the supposed requirement for the hill Cumorah to be a massive military bastion is unwarranted. It is always referred to as “hill,” not a mountain. It is probable that the location was chosen for the final battles of both civilizations because of its sacredness rather than for its military advantage. It is interesting that in the early generations of the Jaredites that the Lord directed Omer to go to Ramah (Cumorah). (Ether 9:3) Cumorah was a depository of ancient records and may have been so prior to the Jaredites, in the days of Enoch. Why did Coriantumr gather all his people to the hill Ramah/Cumorah for their final battle? Why did Mormon think he would have an advantage by gathering his people to the hill Cumorah for their final stand? Do not a people always gather to the temple of the God of their fathers to invoke the assistance of their father’s God in the day of their greatest peril? The ancient Jews have always gathered around the temple of their fathers’ God in their darkest hours and will again in the last final battle. Cumorah may be a more sacred place than we know. Theodore, not to nitpick, but suggesting that the Hill Cumorah was a temple-like sacred place to the Nephites, or to Mormon, is not only unsupported by the text, but the suggestion also doesn’t lend support to any particular geographic model of where the hill was. However, the text implies strongly that the Lamanite king knew which hill Mormon was referring to, since Mormon asked free passage to that place for his people so they could gather there for the final battle, and his request was granted. The Lamanite king wouldn’t have granted free passage to a place unknown to him, and he would know about it because of its physical prominence, not because it was famous for its religious significance. Its religious significance was still a well-kept secret as a hiding place. And it is impossible the king would know of the New York drumlin because of its physical prominence, as it is just one of dozens of such hills it that area of New York, many of which are bigger than the one where the plates were hidden. Moreover, Mormon knew that Cumorah offered no protection as a secretly sacred landmark. He knew that the Nephite history began with Lehi leaving Jerusalem, the city where the temple was located, specifically because God, regardless of the temple’s presence, couldn’t protect the city’s wicked people from destruction. Mormon said as much about his own people in Mormon 5:2–he was without hope that God could protect them. So, Cumorah was well known by people who didn’t live in the area near it, because of its size and prominence in relation to its surroundings. This was never true of the the Manchester drumlin–it was known only to local villagers, but even they didn’t consider it unique or special. And archaeolocial evidence show us the New York area around it never supported any large population. The real Cumorah was probably called a hill because the term “mountain” was reserved for peaks 70 miles to the west which were so elevated they were well over a mile higher than Utah’s Mt. Timpanogos. There is a plethora of archeological evidence connecting Mesoamerica to the all of the Mississippi basin as well as to the Southeastern US. Yes, but that evidence is all too late to be part of the Book of Mormon, and way too far south to say anything about New York. Evidence from the wrong time and wrong place is not actually evidence. It is unquestionable that there is a long tradition linking the New York hill with the hill Cumorah from the Book of Mormon. As Theodore Brandley has pointed out, this association can be found in a lot of late accounts. The historical question, however, isn’t what it became–but how it became the association. What does that suggest? That Joseph himself, who should have known the name had Moroni given it, did not use it until after others had already started using the name. If two trained historians who have gone through the documents come to that conclusion, on what basis might we contradict them by using all of the later comments that have been posted? The name can be traced to 1835, but it is quite probable that Oliver Cowdery (not Joseph) was using the name in 1830. Reeve and Cowan note that Oliver is said to have used the term in 1830–but the reference comes from a Parley P. Pratt’s autobiography, which comes later. We don’t have firm evidence of the earlier use. The real problem with that statement is that there is no indication that the plates delivered to Joseph were in the hill Cumorah. Mormon buried plates in Cumorah, but not those he gave to Moroni (see Mormon 6:6). In order to associate the NY hill with Cumorah we have to have make two leaps. One is that Moroni told Joseph (I am unaware of Moroni visiting Oliver without Joseph–or at all), and Joseph forgot but Oliver remembered. The second is that we have to posit Moroni putting the plates in the hill Cumorah long after the Nephites were destroyed. That is possible, but the only evidence for it is the circular reasoning that uses the association with the NY hill as Cumorah to justify that they must have been buried there. What reasons might we use to suggest that the NY hill isn’t the Book of Mormon Cumorah? 1) The lack of Joseph’s using the name until after others had adopted it (similar to his adoption of urim and thummim which began with W. W. Phelps). 2) The archaeological information that it is a “clean hill,” without any indication of anything of any significance happening there. 3) Mormon 6:6 says that the plates for the Book of Mormon weren’t buried in Cumorah, although the rest of the Nephite archive was. 4) Cumorah was probably the worst place to hide them. As a location of a defeated people, it was almost certainly ransacked for valuables after the battle by some people–even it not by the conquering army. If it really was considered sacred, then it would continue to have visitors–that is common with sacred locations. 5) There is no proposed Book of Mormon geography that works with the NY hill. Problems come with relationships to the east sea, the land northward (which was said to have large populations–not present in NY at that time, and certainly not farther north), or with the correlation to populations. The hill Cumorah was in Jaredite lands and Nephites didn’t arrive their until very late. The woodland cultures don’t show that kind of cultural separation that the Book of Mormon requires. 6) The fact that the Book of Mormon plates were taken from the hill in NY doesn’t require that it be the very same hill as the Cumorah in the Book of Mormon. Since the text doesn’t indicate that those plates were in Cumorah. I find it interesting that Oliver states (in his letter VII) that the plates for the Book of Mormon were not buried in Cumorah, but were given to Moroni. That means that he read the text correctly–but somehow still assumed that Moroni returned those plates to that hill even though there is no record of it. You can ignore it or find hundreds of ways to argue your way around it, but the evidence is clear from multiple sources that Moroni, prior to the the translation, told Joseph Smith the the hill in New York was known as Cumorah by the ancient Nephihtes. You can believe whatever you want to believe, but if you want to know the truth you will start with the only known Book of Mormon location, the hill Cumorah in the state of New York. Unfortunately, Brother Brantley, Heartlanders have earned a reputation for suggesting that those who disagree with their geographic model are spiritually inferior, or, in this case, insufficiently pursuing the truth. Your last post was another step in that direction. But if we’re all in agreement that the Book of Mormon is authentic, none of us should be considered non-seekers of truth. If your evidentiary arguments don’t persuade others that the Hill Cumorah was in New York, do you think put-downs like this will succeed? You mean multiple *late hearsay* sources once the identity of Cumorah had become commonplace among Latter-day Saints. That’s fine if you want to dogmatically insist that Cumorah is in New York based on these sources. What you have to do after that, to be consistent, is then accept that Lehi landed in Chile, that the Land of Nephi was in South America, the Isthmus of Darien was the Narrow Neck of Land, the Land Northward was is North America, and the River Sidon was the Magdalena River in Colombia. Because that was also the predominant theory accepted by nineteenth century Latter-day Saints who also accepted Cumorah being in New York. Come on now, Brother Brandley, you don’t want to be selective in which authority you appeal to, now do you? Moroni had decades after the last battle that destroyed the Nephite nation to travel by boat from the seacoast near the battle site, along the coastal waters of the Gulf of Mexico. At the delta of the Mississippi River he could have traveled upstream to the Chicago area and portaged to Lake Michigan and through Lake Huron and Lake Erie to the streams that formed the basis for the Erie Canal, which were a waterway used by American Indians and fur trappers, as far east as the portage at what became Fort Stanwyx during the Revolution. Palmyra is well west of there. On the other hand, in light of the strong current in the Mississippi and the seasonal flooding, and the snags and sandbars that presented a hazard to navigation in the days when Mark Twain was a river pilot, it may have been easier for Moroni to continue along tge coast, taking advantage of the barrier islands that still protect the Intracoastal Waterway, reaching the St. Lawrence river to Lake Ontario, and debarking just a few miles north of Palmyra. A journey by water would be easier than hauling 60 to 70 pounds of the plates, breastplate, sword of Laban and Interpreters on his back or a travois. Recall that he also had the Liahona, which could guide him to a destination he had never been to, and that the Lord had guided both Nephi and the Jaredites in constructing water vessels. Moroni testified that the three Nephite disciples had visited him and his father. I would not be surprised if one or more of them helped him paddle his boat on that journey. David Whitmer spoke of seeing an old man who apparently was carrying the gold plates. Later on, his mother Mary told her children and grandchildren that “an old man” had pulled the plates out of a backpack and shown them to her to reward her sacrifice in supporting the translation in her home. While her family said this must have been Moroni, they also said that she insisted the “old man” said his name was Nephi. Note that Joseph’s description of Moroni is of a glorified resurrected being, not an “old man”. It seems more logical to me that this was Nephi, one of the three Nephite disciples, who had been “translated” and his life extended, but not yet resurrected. None of the written accounts by Joseph about Moroni name the hill. In D&C 128, Joseph is speaking in his own voice when he calls on the Saints to create an accurate record of the ordinances performed for their dead family members. In 1842 he refers to the hill as Cumorah, using what had become a common assumption among the Saints by then. But Palmyra, Rome, Utica and Syracuse, New York, are thousands of miles from the original Old World cities with those names. New York is not the same as York in England, nor are Manchester or Rochester or Albany in the same place as their namesake cities. Calling the hill Cumorah does not mean there is not another hill named Cumorah elsewhere in the Americas, just as Bountiful, Utah, does not preclude the reality of an earlier Bountiful in the Arabian Peninsula. Modern Superfund sites with landfills containing toxic naterials are generally covered with impermeable clay to prevent precipitation oercolating through the material, sloped to aid runoff, and then covered with soil and native plants which form a self-renewing cap that resists erosion. The burial mounds of Europe and the Americas have demonstrated that living turf can endure for thousands of years. Additionally, surface precipitation is taken up by the plant roots and used by the plants and evaporated back to the air. I suggest that the grassy soil concealing the edge of the covering stone was a remnant of a turf cap that initially covered the whole cover stone, with a layer of impermeable clay over the stone. I think Moroni uncovered the top of the stone so Joseph could find it. The article and comments are interesting to the mind of man. However, do they, or are they, sanctifying in any spectrum? Alma 37 with emphasis on V 9 indicates what the content of scripture does to edify and sanctify people. It is the contents of scripture that matters. See Jeremiah 23. False Christs identified in scripture are the many Churches that have arisen doing with Bible content what is being done here with elements of The Church of Jesus Christ of Latter-Day Saints history. Would our time be better spent in study of scripture such as Alma chapters 33-34 along with reading our four Standard Works cover to cover. There be a better use of our time. Joseph Smith and his brethren spent considerable time studying Greek, Hebrew, theology, and other relevant subjects in the School of the Prophets in Kirtland, Ohio, and we have all been admonished to “seek ye diligently and teach one another words of wisdom; yea, seek ye out of the best books words of wisdom; seek learning, even by study and also by faith.” D&C 88:118. The proof of any plan is in what it produces: a blueprint must produce a usable building, a drawing must produce a usable car or airplane, a recipe must produce something that can be eaten. A recipe signed by twelve archangels that tastes like crap is still crap. The “Mesoamerican Model” is a minutely detailed map that can be tested. I’ve tested it, moving BOM armies around on paper, and it works very, very well. You could have the “Heartland Model” signed by the entire Quorum of the Twelve, and it still doesn’t work. The American Civil War was fought over much of the same ground as the Heartland Model, and we know what it took to support Union and Confederate armies for years at a time, and BOM technology could never have managed it. I’m tired of this recurring discussion and I kind of wish you guys would just go away and be quiet. Your assumption that an ice age created the drumlins conflicts with Mormon doctrine of the earth’s age. This better would be ascribed to geographic alterations at during Noah’s flood or Christ’s crucifiction.